Welcome to our Dining Beyond Zone 1 series of restaurant reviews, dedicated to seeking out quality local places to dine beyond the frenzy of Central London. It’s not often that a restaurant can claim to genuinely be ‘back by popular demand’ but in this case it isn’t too far off the mark. 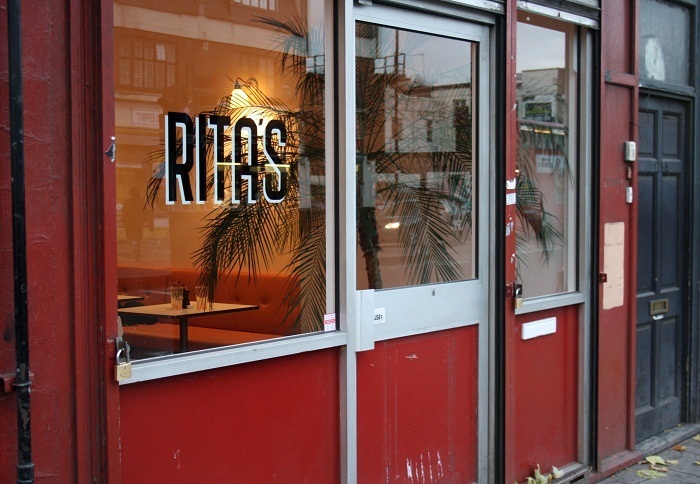 Rita’s began life as a temporary eatery residing in Dalston’s Birthdays and quickly gained a loyal following and a whole lot of love for its unique take on comfort food classics, from fried chicken and glazed wings to chili mac ‘n’ cheese. Its closure in April led to outcry among fans and six months of speculation, until in November last year they finally opened-up Rita’s Bar & Dining on Mare Street. For reference, there is no Rita. The out-of-the-limelight team behind the operation includes Jackson Boxer who also runs Brunswick House Café in Vauxhall and chefs Gabriel Pryce (former Brunswick House) and Andrew Clarke (former Salt Yard). Despite mass foodie fanfare, the restaurant itself is also in the shadows: tucked away behind a tatty and very lightly-branded shop front at the London Fields end of Mare Street, it’s easy to walk past without noticing anything remarkable. Although there’s an element of coming-of-age for any residency that goes on to acquire its own gaff, Rita’s doesn’t feel like it's grown up all that much. Inside, white-wash walls, basic bare-wood tables and a lack of any real decoration other than blackboards keeps the pop-up feel intact, while the menu remains defiantly playful. Their repertoire has widened slightly from the ‘pimped-up junk food’ that became their moniker, with an increasing influence from south east Asia as well as America, but the menu still feels like it’s been whipped-up on the whim of a hungry, comfort-food-craving chef rather than actually planned. Dishes are divided between ‘snacks’, ‘plates’ and those ‘to share’. In terms of size, think of the snacks (£3.50-£6) as starters and the plates (£10-£13) as mains, but with intense flavours that are often better in small quantities we’d recommend all mucking in on some central fodder for the table to go at. From the snacks section, we try baby squid rings made sticky and glossy by a syrupy szechuan pepper sauce that leaves a terrific tingle on the tongue, while chicken wings drenched in a hot, tar-like ginger-soy reduction prove addictive if absolutely unsubtle, and present a risk of severely burnt fingers. Of the larger plates, a tomato-based fish stew is a less-intense but fresh-flavoured departure, with over-sized prawns, mussels and clams a-plenty. A meatball dish lacks any depth of flavour in its tomato sauce (we’d say it needed to be cooked for a lot longer to get the sweetness out of the tomatoes; an Italian would probably be much ruder) but the meatball itself is a pleasure, wrapped in succulent, melting lardo that slowly bastes as it cooks. 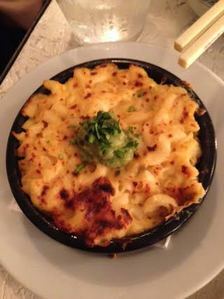 A side of mac ‘n’ cheese blows both dishes out of the water, made special through the addition of tangy green chili that cuts through the cheese-dense creamy sauce, while a blob of guacamole on top is the perfect antidote to its richness: it’s a dish of clever contrasts. We sup cocktails (£5.50-£7) throughout, taking in a refreshing but still strong Hard Cidre made with French cider, rum, vanilla and apple; the feast of bitterness that is the Palermo made with tequila, campari and grapefruit; and an excellent twist on a Bloody Mary that’s made spicy, salty and with gin instead of vodka. They’re as full-on and varied as the menu is. And – in a similar vein to the food – they’re probably not the most expertly crafted or most balanced cocktails in town, but they’re accessible, fun, quirky and go down very nicely indeed. Our dessert sums the experience up well: dulce de leche beignets topped with shaved foie gras are large, oblong and inelegant in style, but they are also soft, fluffy, outlandish, indulgent and irresistible. There can be few places out there that would dare to plonk ethically-dubious animal liver on top of your pudding, and for the sheer bravado of it Rita’s deserves all the attention it gets. Rita’s is at 175 Mare Street, E8 3RH (map).